The BMW Car Club will once again host the largest gathering of BMW's in Europe on Sunday 17th August 2014. The event promises to be even bigger than last year, with the re naming of the event 'Club BMW '14 Festival' we are hoping to encourage all BMW owners not just members of the club and make it an event for the whole family. Up to 3,000 BMW’s will gather to celebrate all things BMW including the Mini. The focal point of the event will be the arena, where there will be a master of ceremonies, Steve Deeks. There will be speeches by the regional chairs, presentations of the concours winners and competition winners and live music entertainment throughout the day. Some other activities going on during the day will be radio controlled cars, a tombola, wheel changing challenge and special ‘show only’ promotions. The event can guarantee a great family day out with activities to entertain the children while you wonder around the trade stalls and the exhibition of vehicles in front of the arena. There will be bouncy castles and slides as well as face painting and a simulator to keep the children occupied. Throughout the day the Motor Centre and Museum will be open - you will have full use of the restaurant and facilities. 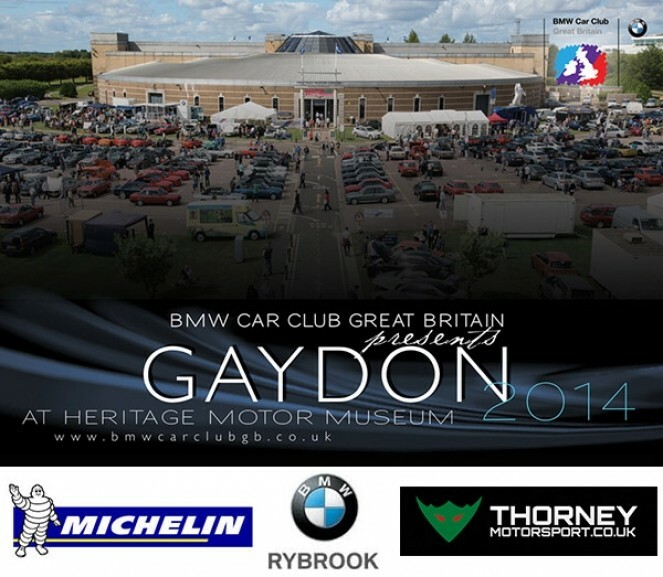 The event is sponsored by Rybrook BMW, Michelin and Thorney Motorsport being main sponsors for the National Concours. Where is it? The Heritage Motor Centre of course. Click here for directions or just google map them! Rally Plaques also available at the Club Office for £2.50 including National Festival window sticker. Photography: BMW Car Club (GB) Ltd.